Oral health includes a healthy flow of saliva. 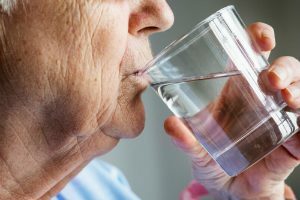 Dry mouth (also called xerostomia) is usually just a short term symptom of dehydration. However, if reduced saliva flow becomes a chronic issue, it can lead to more serious dental problems. That’s because saliva coats teeth to provide a protective layer against bacteria, so reduced saliva leaves teeth more vulnerable to cavities and tooth decay. Anyone can experience reduced saliva, but it occurs more as we age and tends to affect women more often than men. Additionally, many prescription medications include dry mouth as a side effect, so be sure to recognize this as a possible cause. What many of my patients may not know is that there’s a serious disorder that includes reduced salivary function, and it’s called Sjögren’s Syndrome. This autoimmune disorder primarily strikes women over 40 and may grow progressively worse through mid-life. Sjögren’s syndrome is primarily characterized by dry mouth, but may also include dry eyes, skin dryness, or fatigue. Sufferers often experience a huge increase in cavities and oral ulcers (canker sores) as well. Fortunately, xerostomia and Sjögren’s are both treatable, and we can monitor for early signs of cavities and decay during routine checkups. Check side effects of medication. Try rinses designed for dry mouth. Nighttime snoring or mouth breathing? Try a humidifier. Regular dental checkups to monitor oral health.